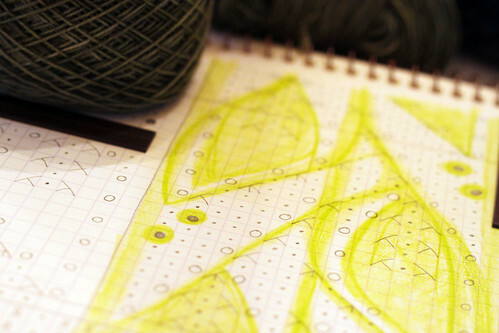 Here is a photo of the lace insertion pattern I am going to try and knit as a sock pattern repeat. I think it will work to put two knit stitches between repeats at the top of the sock and then decrease down to one an inch or two above the ankle. Then knit the remaining side stitches as part of the bottom foot instead of the top to decrease the foot a little more. Hopefully it will work. I also bought some addi turbo circular lace needles. I like how much easier the stitches slide over the join and the extra pointy tips. They should make the knitting go faster. The problem is the size #1 are 2.5mm and the size#1 Pryms which I was using are 2.25mm. I hope that fraction of a mm doesn’t throw my working gauges off too much. It is always something. Coloring in the cart does help me see the pattern. I made some mistakes on it though. I am doing the bobbles as crochet cluster stitches. Knit bobbles look funny when viewed upside down as on a sock. This entry was posted on Saturday, June 13th, 2009 at 3:00 am and is filed under Knitting. Tagged: Knitting. You can feed this entry. You can leave a response, or trackback from your own site.